Three years ago, the city of Akron renovated the public space on Main Street between the Huntington Bank tower and PNC building. Since then, Cascade Plaza has been programed more and more each year to encourage downtown employees, residents and guests to get out and explore the space in fun and unusual ways. This summer's line up offers many new activities and attractions for lunch, after work and weekends that will allow people to enjoy the outdoors, get moving and maybe meet some new friends. A few events even extend out of Cascade Plaza giving you the opportunity to explore more parts of the neighborhood. Plus, beginning June 15 free wifi will be provided on Cascade Plaza powered by DSI. Starting in June, we invite you to participate in any number of events. Attendance to these events is free through a grant from the John S. and James L. Knight Foundation. 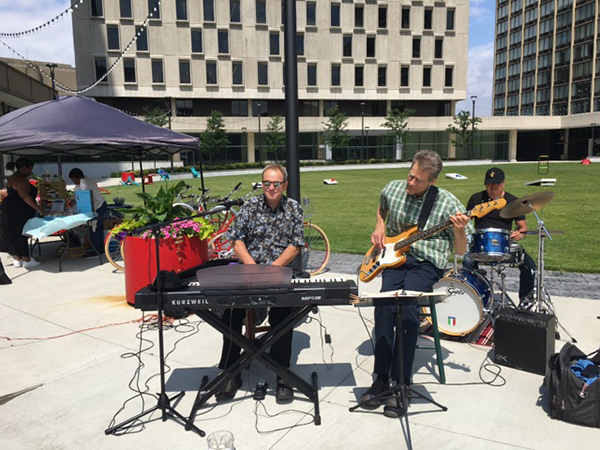 During Food Fridays Al Fresco, the city of Akron's Cascade Cucina welcomes food trucks to the plaza from 11 a.m.-1:30 p.m. complete with live music from 12-1 p.m. Just across the street and down Mill, the JSK Cafe also returns with outdoor dining on the Hamo Plaza also from 11 a.m.-1:30 p.m.
After a successful season of Yoga, Zumba has been added to the exercise line up on Cascade Plaza on the first Saturday of every month from 10:30 a.m.-12 p.m. through September. Stick around after class for Blanket Brunches complete with food and drink offerings, like Bloody Mary's and Mimosas. Instructor Christy Leenheer from Forever Fitness 24 will lead the hour long class. On Mondays from 11:30 a.m.-1 p.m. we invite downtowners to pack a lunch or grab something from a nearby restaurants and come out of the office for a Picnic on the Plaza. Tables and chairs are available, or you're welcome to bring your own blanket. Wednesdays through Fridays from 11 a.m.-1:30 p.m. we'll have plenty of games to challenge your co workers. 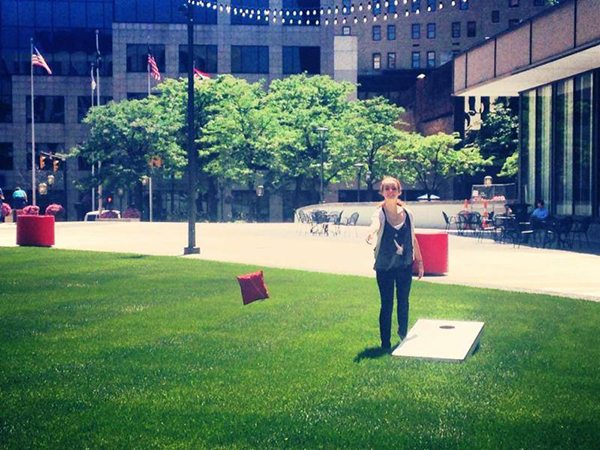 Whether it's corn hole, bocce ball or checkers and chess, the competition will be fierce at lunchtime recess. After a long day at work, unwind on Wednesdays from 6-7 p.m. with free yoga courtesy of Akron Yoga & Wellness. Two new weekly leagues are coming to downtown, thanks to a partnership with Stay in Play Recreation. Spikeball (combo of foursquare and volleyball) and Bocce Ball take place on Thursdays from 6-8 p.m. (June 14-Aug. 9) complete with Cascade Happy Hour from 4-8 p.m. (serving beer only). Lace up your skates and put on your leg warmers for old school roller skate parties on the second Friday of each month through August. Each month pays tribute to a different decade (June,70s; July, 80s and Aug, 90s) so feel free to dress the part. Roller skates are available to rent (or bring your own). If skating isn't your thing, then join in on a dance party in grass complete with DJ, bar and food truck offerings. On Tuesdays, head over to the main library's amphitheater on the corner of Mill and Main for the Amp it UP concert series from 12-1 featuring a different local musician each week. With this diverse line up of events and activities, be sure to explore and try something new this summer in downtown Akron.